MELBOURNE – Eventually, some player was going to take out a member of the Big 4 and win a Grand Slam. It had not occurred since 2009 when Juan Martin Del Potro stunned Rafael Nadal and Roger Federer at the US Open. Sixteen Slams went by and Nadal, Federer, Novak Djokovic or Andy Murray captured them. Last year, Stanislas Wawrinka began to rise out of the veteran doldrums, reaching the ATP Finals for the first time, finishing in the final eight and almost upending Djokovic at the Australian and US Opens. But was unable to win those contests or some other critical ones because he seemed to be missing a little extra oomph and kick on his shots at the end of matches. He seemed to freeze and a Big 4 member shut him down. 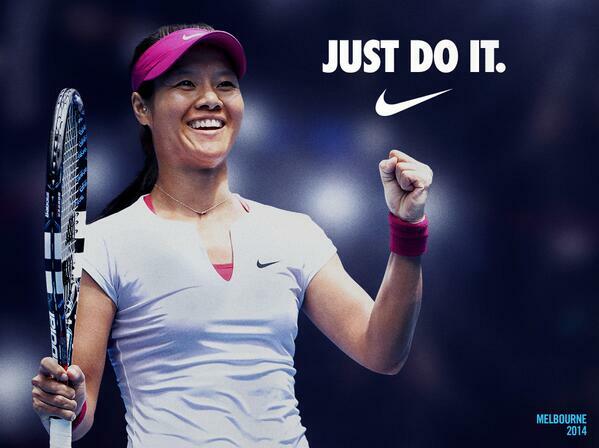 But not at this Australian Open. His coach, Magnus Norman, convinced that he was good enough – that he could sting first serves, flat forehands and booming backhands. He overturned his two five-set losses to Djokovic by stopping the Serbian and his 28-match winning streak cold in the quarterfinals. He did not allow big Tomas Berdych to break his serve in the semis, and then in the final, he finally hit through a man whom he came into the match with an 0-12 record against. He came out flying and despite some shaky moments against Rafael Nadal and his bad back, he triumphed 6-3 6-2 3-6 6-3. Yes, Nadal’s back began to hurt in the warmup, but the Spaniard hung in there and even though he was below his level he tried to survive, hence his taking of the third set. Wawrinka was nervous then as it’s never easy to play an injured foe because it’s hard to get rhythm or figure out a winning strategy. Nadal did regain a bit of speed and a smidgen of power in the fourth set which forced Wawrinka to play fairly well again. He admitted that the occasion was huge and he was not completely himself, but he kept battling his own demons and was terrific in the last two games. He ripped a forehand down the line winner to break Nadal to 5-3. Then he held at love to win the crown: he nailed a service winner; put together a clean serve and volley; smacked another service winner wide and then won the contest with a blitzing forehand winner. 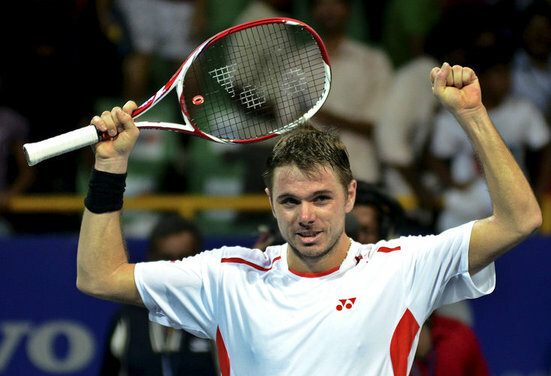 Wawrinka became the first guy to defeat the No. 1 and No. 2 seeds at a Grand Slam since Sergi Bruguera did it 1993 Roland Garros when he overcame Pete Sampras and Jim Courier. He became the first No. 8 seed to win a major since the 1980 Australian when Brian took the title. So now Nadal leaves Australia without a coveted 14th Slam title. Federer still owns 17, Djokovic six and Murray two. Del Potro owns one and now so does Wawrinka who at the age of 28 may not be done yet. He owns an attractive game and is a refreshing personality that the tour is glad to have. MELBOURNE – Rafael Nadal says that he gets more emotional for his matches against Roger Federer than against any other player, which is not surprising given that when the Spaniard arrived on the scene that the Swiss was the tour’s dominant competitor and looked unstoppable when he was on. But since the 2008 Wimbledon final, when Nadal stopped Federer in home away from home, the lefthander has seized control of the rivalry and could soon be blessed with the description of the Greatest Of All Time [GOAT]. In Nadal’s 7-6 6-3 6-2 victory over the Swiss in the 2014 Australian Open semifinals, he sure looked like he’s ready to contender for that moniker. Federer played fairly well during the semifinal, but still couldn’t get over the hump as Nadal simply waited out his George Foreman-like barrage early on like Muhammad Ali did against the slugger during the ‘Thrilla in Manila.’ Federer threw everything he had at Nadal: huge serves, forehands, net rushes – even flat one-handed backhand as hard as he could strike them. But what he could not do was return serve consistently well enough and could not manage to get a break point on Nadal’s serves. While Federer’s whirlwind attack was eye-popping at times and had fans on their feet, Nadal was very consistent and counterpunched with authority. 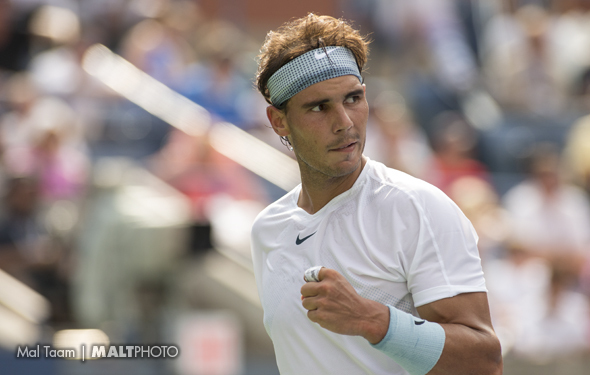 He moved quickly, kept his groundstrokes deep and worked the points as hard and long as he could. He decided upon that strategy because this is what he knew going into the match after watching the tape of their 2012 Australian semifinal in the morning: that Federer would whale away early and as long as Nadal didn’t get down on himself, eventually Federer would begin to punch himself out and then Nadal would be able to throw big body blows of his own when the openings were there and eventually score a knockout. Federer badly needed to win the first set in order to give himself a chance at victory. He had not dropped the first set against Nadal and come back to win the match since 2007 Hamburg so the odds were clearly against him. Federer had chance in the tiebreaker after Nadal committed three straight unforced errors and the Swiss drew back to 4-5, but then the Spaniard stung an inside out forehand winner and Federer missed a backhand down the line. The tiebreaker was in Nadal’s pocket at 7-4 and for all intents and purposes, so was the match, as Nadal’s two-handed backhand stood up better against Federer’s forehand than the Swiss’ one-handed backhand stood up against Nadal’s forehand. As the match grew older, Federer had a hard time hitting perfect enough approach shots and Nadal consistently passed him. Federer also could not get enough significant returns into play as Nadal’s blistered hand had improved and he had wicked spin and kick on his favored serves. Simply put, Nadal’s left hook was more powerful and effective that Federer’s right-handed cross. Nadal’s record versus Federer now stands at 23-10. He is one victory away from his second Australian Open title, and if he manages to best Stan Wawrinka in the final, he will become the only man in the Open Era to win each major twice – which is glorified Rod Laver territory. He may or may not go down in history as the GOAT, but with his record against Federer — whom most people currently consider the GOAT — he will likely have something to say about it if he wins another couple of majors. But that is a discussion for another day, as Nadal still has to best the red-hot Stan Wawrinka for the title, whom he has a 12-0 head to head record against and whom he has never dropped a set to. The other Swiss – whom by the way will pass Federer when the rankings are released next week – has been tagging his one-handed backhand and been serving huge, but can he actually get over on Nadal if the Spaniard is playing his best? That is extremely doubtful as Nadal is No.1 for a reason – he has been at higher level than anyone else at the majors during the past year. However, Wawrinka did manage to upend the seemingly unbeatable Novak Djokovic in the quarters so that has to give him some belief that he can turn his rivalry around against Nadal, at least on one night. The odds are stacked firmly against him, but he will give it a go. His coach of more than year, Magnus Norman, has impressed upon him that he should try to be relaxed and at the same time go for his shots. 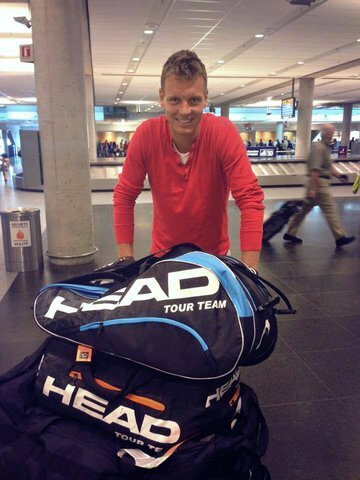 He is going to attempt to keep his poor record against Nadal out of his head. 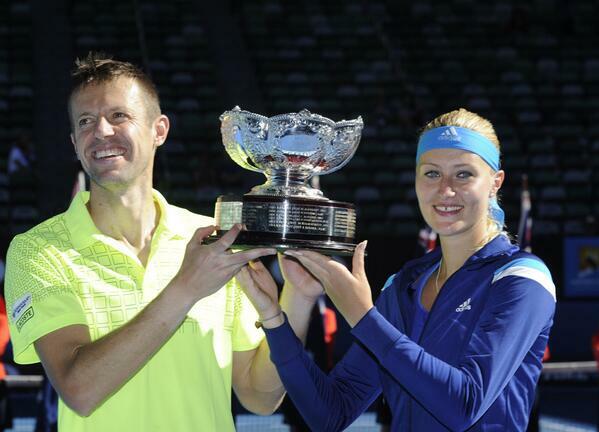 MELBOURNE – Given that they essentially dominated the tour in 2013, the odds of Rafa Nadal and Novak Djokovic meeting in another Grand Slam final were quite high entering the 2014 Australian Open. But tennis times always change, even if they do so at glacial pace. Djokovic has not lost a match since the 2013 US Open final to Nadal entering the event, and had taken care of his matches handily. But finally, a player with flair and courage ended his win streak when Stan Wawrinka took him out 2‑6, 6‑4, 6‑2, 3‑6, 9‑7 in a five-set classic. The Swiss was overdue for a win over the Serbian, especially after he had lost two five-setters to him at the 2013 Aussie Open and US Open. But he still had to earn it, or at least keep pushing Djokovic until he made a couple of critical and unthinkable errors, which he did in the last two points of the match. The 22-year-old Bulgarian Grigor Dimitrov could have done much the same against Nadal, going deep inside himself in order to convince himself that he could actually win the match but he does not have the 28-year-old Wawrinka’s experience. So, even when he was out playing the Spaniard and Nadal’s blistered and bloody left hand look ready to fall off, he could not come up with sustained brilliance when it mattered most. 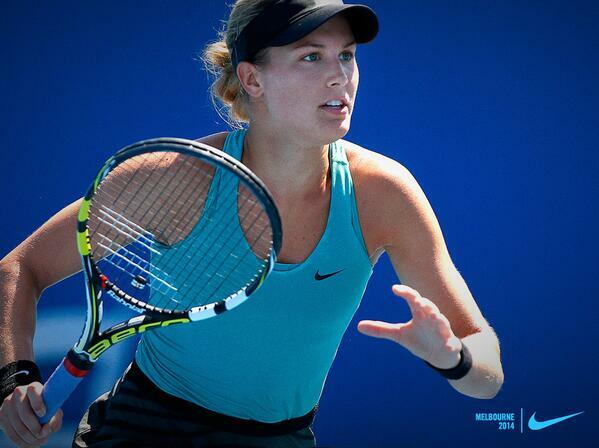 The young shotmaker played poorly in the second and third-set tiebreaks and fell 3-6 7-6 (3) 7-6 (7) 6-2. He missed two critical and easy forehands in the third-set breaker, one on his own set point and another on Nadal’s. After the Spaniard had missed an easy inside out forehand – a shot he struggled with most of the day – Dimitrov had the whole court open at 6-5 after hitting an excellent serve and he yanked an easy forehand wide. Dimitrov then put away a sweet backhand volley to 7-6, but Nadal responded with smart net rush of his own and grabbed the point with a nifty forehand volley. With Nadal holding a set point at 8-7, Dimitrov looked at a sitter forehand in the middle of the court, leaped up in the air and again yanked it wide. The set was gone and so were his chances at a win as Nadal out muscled him the rest of the way. 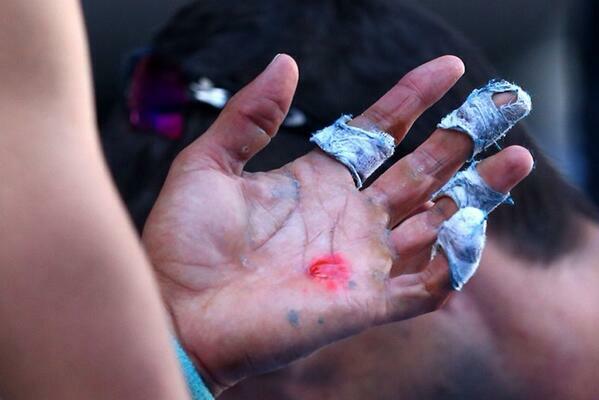 Nadal’s left hand contains a huge blister the size of an Australian 50 cent coin. He can’t serve hard because he’s afraid that his racquet is going to fall out of his hand. He is hoping that in two days – when he takes on Roger Federer – that his hand will feel a little better and he can serve with more force, but he suffered quite a bit on Wednesday. Not as much as Djokovic did, who has already headed back to Serbia, but enough to wear a grimace on his face all day long. But Nadal does not seem to mind as his desire burns deep. Next up for him will be one of his greatest rivals, Federer, who wore down Andy Murray in four sets, and who has been on fire at the tournament. However, Federer hasn’t beaten Nadal at a major since 2007 Wimbledon. Even if Nadal is dripping blood, he will fight like crazy to each the final. 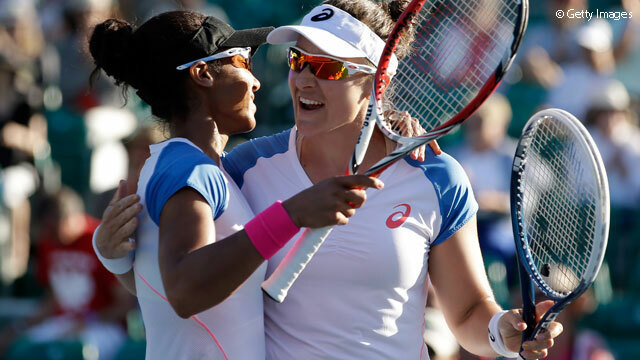 Agnieszka Radwanska was not in the same position as Wawrinka or Dimitrov was entering their matches, but she had been in a bad way the past two years against fellow 24-year-old Victoria Azarenka. On Wednesday she played more freely against then than she has at any time in recent memory and pulled off a 6-1 5-7 6-0 upset. Azarenka complimented Radwanska on playing amazingly well, but also said that she was too predictable and wasn’t thinking hard enough. But for Radwanska – who blew a huge chance at Wimbledon last year to win a maiden Slam– it was a standout performance, especially from the mental side. Her creative side and quickness is always there but her confidence is elusive against the elite. The little magician has admitted that it took her a while get over her loss to Sabine Lisicki in the semifinals of 2013 Wimbledon when she was the highest remaining seed left in he draw, but she found a way to look at the future. Radwanska will face Dominika Cibulkova in the semis on Thursday, whom she says she has known since they were facing off as 8- or 9-year-olds in Eastern Europe. 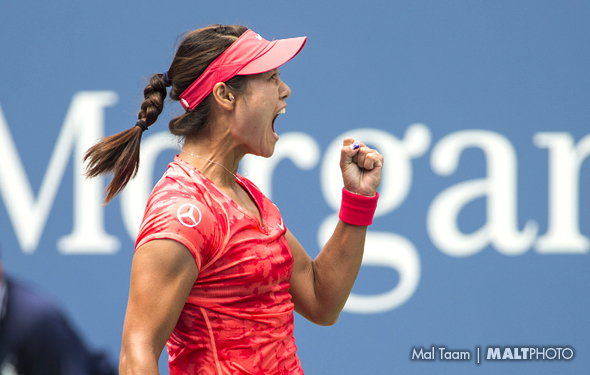 She will be favored in that match and will be seen as an equal to Li Na should they meet in the final, assuming Li finds away to put down Canadian teen Genie Bouchard. Then another golden opportunity will be presented to her.